Renoel Pael of the Philippines faces Go Onaga of Japan for a 10-round non-title fight on March 13, 2016 at City Gym, Tomigusuku, Okinawa. 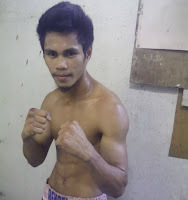 Renoel Pael is a 25 years old boxer from Matalom, Leyte, Philippines. He ha a record consisting of 19W(12KO)-2L-2D. He is a former Philippines Boxing Federation (PBF) bantamweight champion. He is an aggressive fighter with a strong chin. Pael fought Noknoi Sitthiprasert of Thailand in 2014 but loses via Split Decision. The Filipino fighter last seen losing to Adrian Diale last December 2015 via UD. On the other hand, Go Onaga is a hard hitting Japanese boxer with the record of 26W(18KO)-2L-2D. The 35 years old fighter is now at his 9 streak wins. Ranked 17th in the world at super flyweight division. Onaga-Pael fight is brought to you by Akinobu Hiranaka of Hiranaka Boxing School.